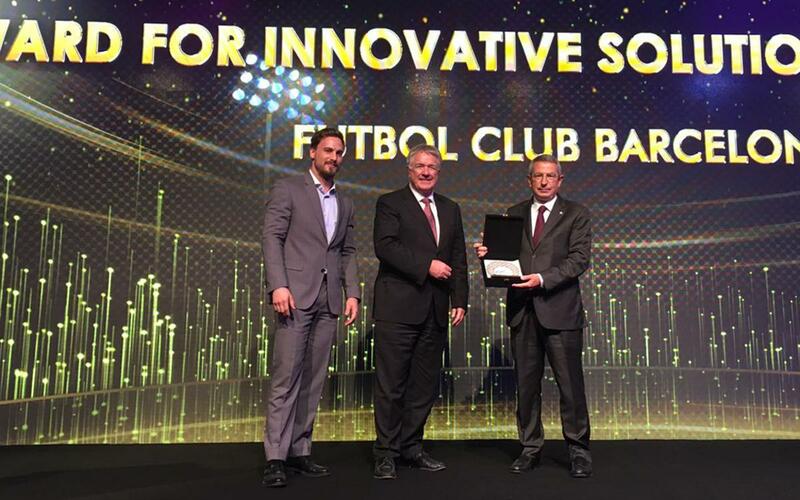 FC Barcelona's 'Estadi Conectat' project was named the Innovative Solution of the Year at the World Stadium Congress in Doha, Qatar, which recognized the project for having brought an expansive Wi-Fi network to Camp Nou. The World Stadium Congress is an annual event that brings together leaders in the sports stadium industry, from the areas of construction and management to fan experience. The ceremony was held within the framework of the Congress, which opened on Sunday in Doha and which wraps up Wednesday evening. FC Barcelona director, Pau Vilanova, accepted the award on behalf of the Club. FC Barcelona's project, which won the award, placed an emphasis on the rollout of a top-quality Wi-Fi network at Camp Nou, Europe's largest stadium, which was completed in 1957 and which has a seating capacity of 99,354. This enormous technological challenge has had excellent results, shattering the peak broadband download record—the amount of content downloaded from the internet by users—during the last El Clásico, with 7.07 Gbps, doubling the previous mark, which was set by the Super Bowl. Since free Wi-Fi has been available at camp no, more than 1 million people have connected to it, and average of 25% of all fans who have attended games there. Moreover, Wi-Fi coverage is not limited to the stadium itself, it also arrives to the rest of the Club's facilities, including the Palau Blaugrana, the FC Barcelona museum, and the outdoor esplanades surrounding the stadium. To achieve this, the club installed around 1,500 antennas, via it's Wi-Fi partner, Telefonica.